The Top 3 reasons why the Motif platform has become the best selling line of Keyboard workstations of all time are: 1. Motifator.com (forgive our immodesty!) 2. It sounds fantastic and 3. because it offers incredible internal recording facilities that also interact with the outside world of DAWs. 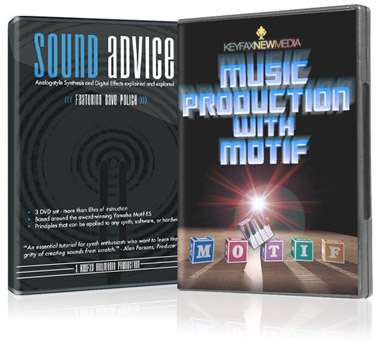 Since 2001 Motifator.com’s KEYFAX NewMedia has produced some 20 DVDs on or related to the Motif series and these two titles represent some of the most in-depth and compelling work on the platform. Motif: Inside Job offers an incredible deal on 13 hours of instructional material that will turn you in a Motif guru! Sound Advice was filmed in 2007 using the still splendid Motif ES. This 3-DVD set runs at almost 9 hours and looks at every conceivable twist and turn of sound design using the Motif’s AWM2 Tone Generator that is still used on the current flagship model Motif XF. Music Production With Motif offers the reverse perspective. Filmed on the Motif XF in 2014, this program focuses on music production – 16-track Pattern and Song recording on Motif using Phrases, Arpeggios, and a raft of state-of-the-art effects processing. The Motif XF may have a fancy color display but its recording engine and underlying system are largely unchanged from the original Motif, never mind the Motif ES. If you want the inside scoop on this platform: how to create new sounds, how to record loops, how to apply effects, how to send the results of your labors onto the world outside of DAWs and WAVE files, then Motif: Inside Job, with its full One Third Off the price of these two incredible programs, is exactly what you need.